Click on the thumbnails for closer views. 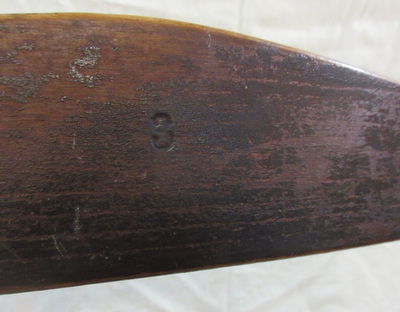 Please use the contact form to inquire about any of the objects shown on this page. Below: 19th C. Farm Cart or "Goat Cart". Exceptionally nice piece of Americana. Dimensions approx. 36" long, 27" high, 26" wide. Iron shod wooden wheels. Chip carving front & back of floor boards. Pretty good condition for its age, all complete. You could use it in your garden if you don't plan to display it. $550. May be examined by appointment. 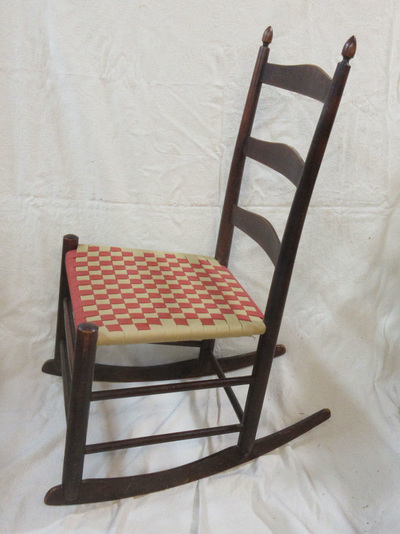 SOLD Below: Set of Four 19th C. Country Windsor Side Chairs in old green & black paint. As picked, normal wear & tear. Sturdy. Below: Striking Arts & Crafts side chair of oak with a stylized flower of copper and pewter inlaid into the burl veneered back. Height 42", seat height 18", seat width 16". 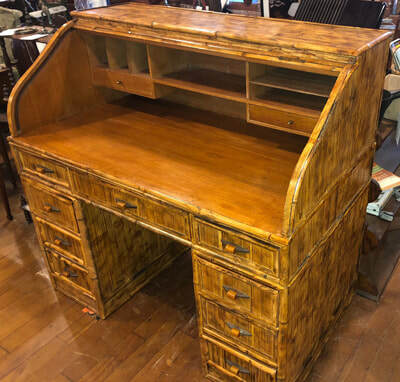 Unmarked, attributed to Stickley Brothers, Grand Rapids (c. 1910). New woven fiber rush seat, cleaned & polished. $750. May be examined in Booth #8 at Canal Street Antiques Mall, 181 Canal St., Lawrence, MA. 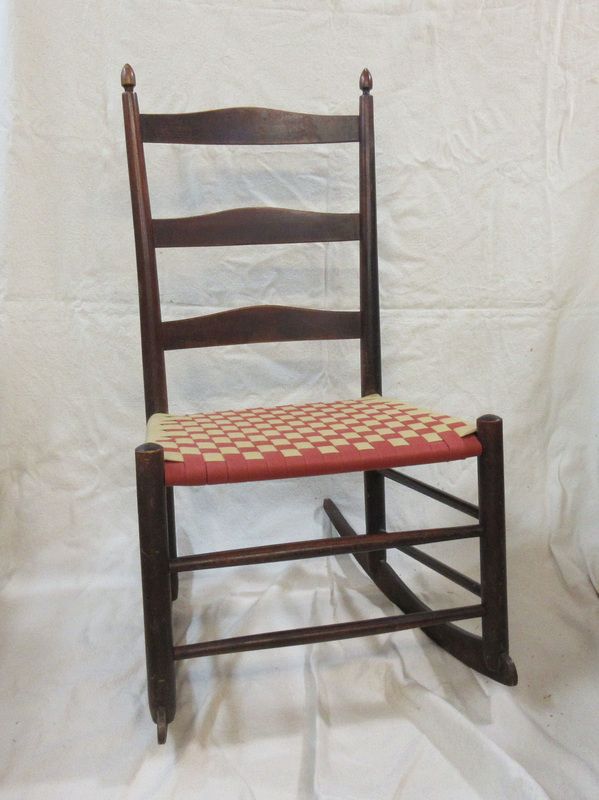 Below: Set of six 19th-century paint-decorated side chairs (one shown). 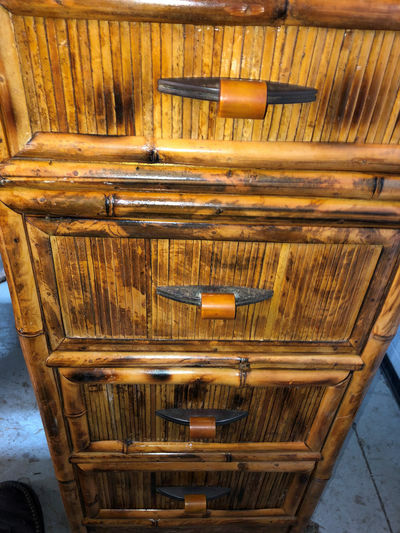 Normal wear & tear, very sturdy. All 6 for $400. May be examined at Canal Street Antiques Mall, 181 Canal Street, Lawrence, MA. Below: Youth-Sized Oak Roll-Top Desk, an unusual size. Fitted gallery, two large drawers & pull-out "typewriter" shelf. Approx. 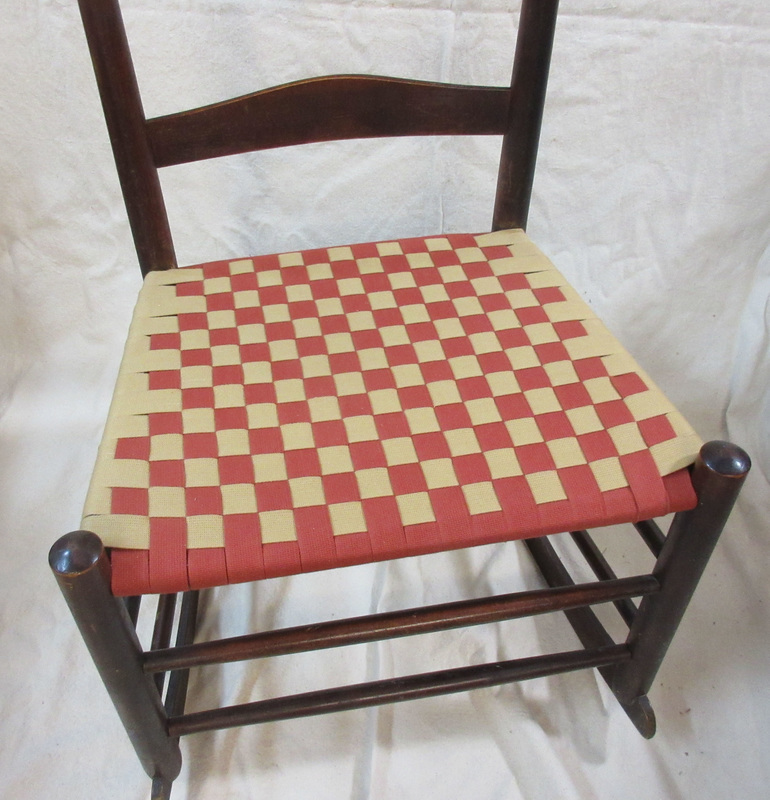 36"H x 31"W x 18"D. Refinished. 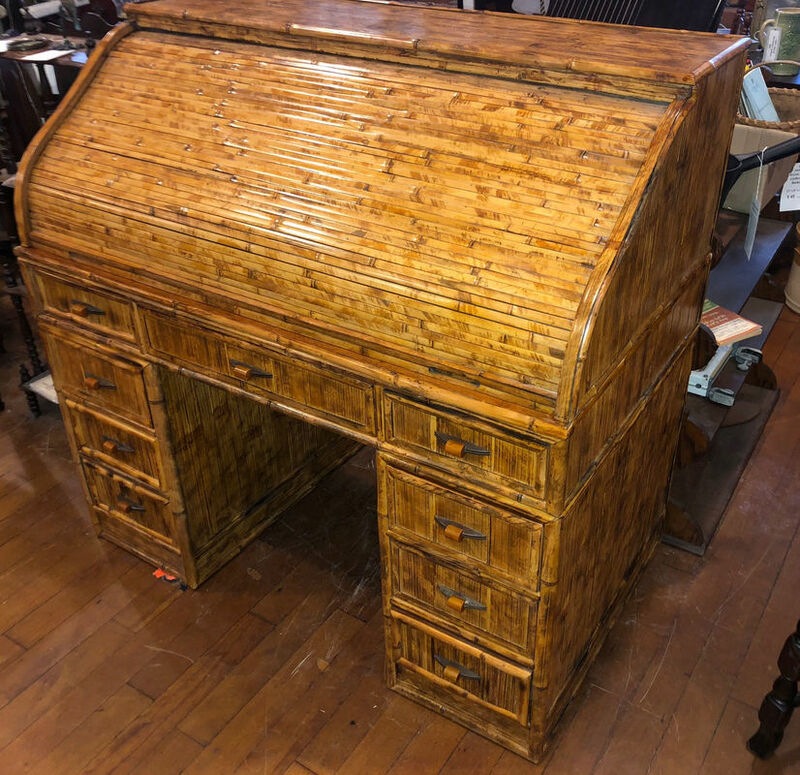 Not marked, but resembles desks made around 1910 by Paris Mfg. Co., South Paris, Maine. Also included: Paris Manufacturing Co medium size swivel chair, maple, branded on underside of seat. $440 for the two. 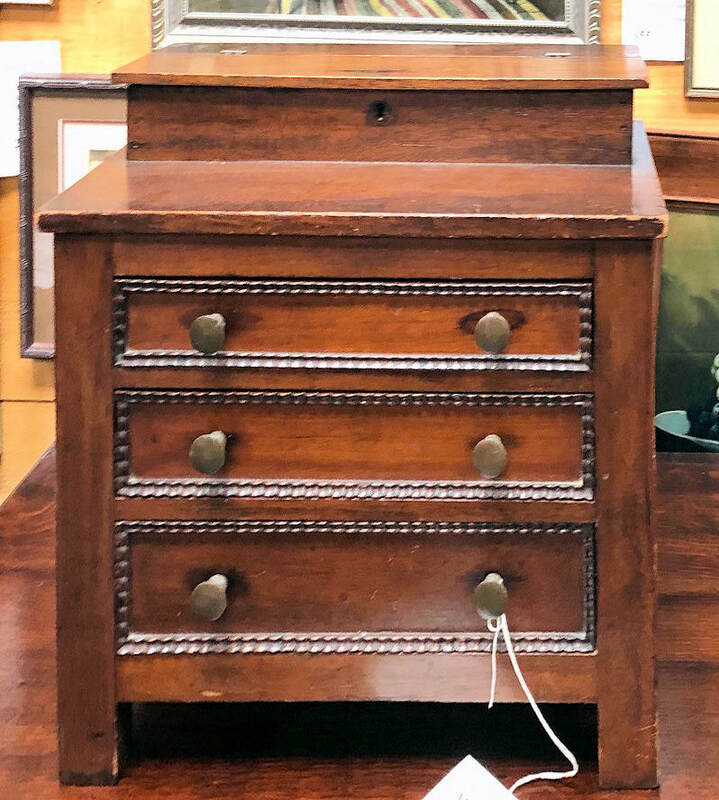 May be examined at Canal Street Antiques Mall, 181 Canal St., Lawrence, MA. 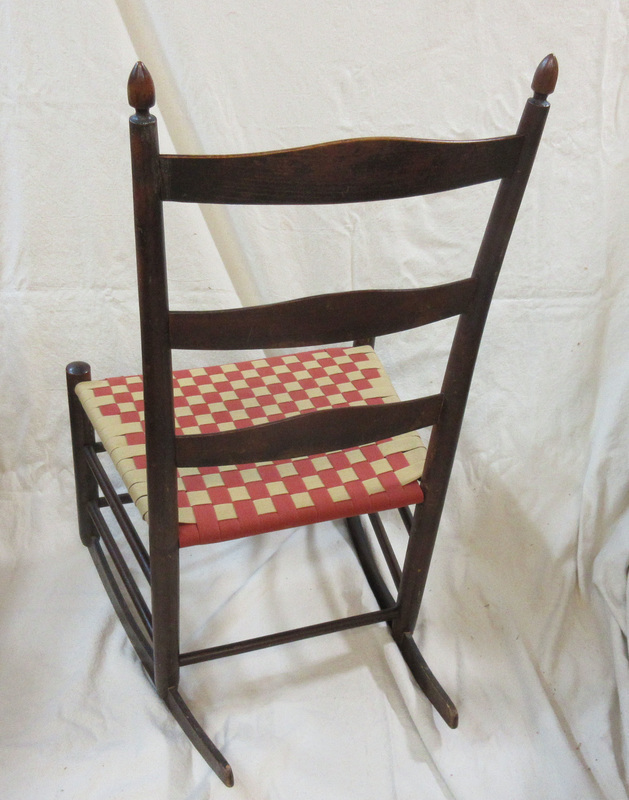 Below: Shaker Mount Lebanon Production #3 Rocking Chair C. 1900. Height 35". Branded #3 on back of crest rail. Tape seat newly installed, light polish. $395. May be examined at Canal Street Antiques Mall, 181 Canal St., Lawrence, MA. Below: Antique Slag Glass 2-socket table lamp marked CCCo, Bronzed Metal and Carmel Overlay Slag Glass, 23" tall & 18" wide, good working condition. Shown illuminated with two 60-watt bulbs. $495 May be examined at Canal Street Antiques Mall, 181 Canal St., Lawrence, MA. May be examined by appointment.